Ondangwa is a town in the Oshana Region, situated in the cultural heartland of northern Namibia. 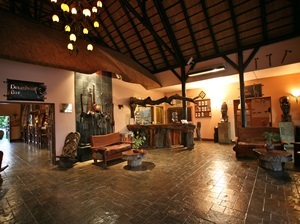 It is approximately 92kms north from the spectacular Etosha National Park and about 80 kms south of the Angolan border. Ondangwa means "the end of the Ondonga area", one of the regions kingdoms. This four star Protea Hotel, has a conference centre, restaurant, bar and large swimming pool. Lazy-lounger chairs and umbrellas are provided for your relaxation after your dip. There are also two garden terraces, with waiter service if required. 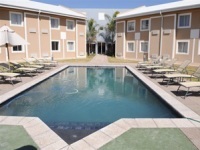 Protea Hotels Ondangwa offers 90 air-conditioned, en-suite rooms, including 2 suites. Every room has an en-suite bathroom, TV, telephone, room service, mini-bar, tea/coffee station and an in-room safe. The restaurant serves an 'a la carte' menu for breakfast, lunch and dinner and a buffet style meal will be served in peak season. Nearby attractions include a Cuca shop tour and cultural tourism route. Situated in the heart of Owamboland, a stone throw from Ondangwa north of Etosha National Park, you are invited to experience our local traditions! Built alongside a live homestead, 4 luxury Rondawels (African-style round huts) accommodate 8 guests offering exclusivity and the luxury of home, while participating in local chores, delighting in local culinary dishes and drinks and learning local arts and crafts. Each Luxury Rondavel is equipped with Twin Beds, private en-suite facilities ( shower only), tea / Coffee station as well as Mosquito Nets. 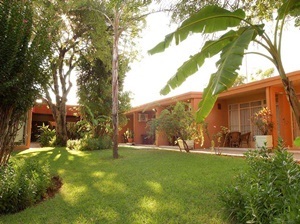 Oshakati Country Hotel offers 50 bedrooms with en-suite facilities. Rooms are fitted with television, air conditioning and direct dial telephones. The impressive thatched main building houses an a la carte restaurant, lounge, bar and conference room which seats 150 people and is popular for banquets and receptions. Airport transfers to the Oshakati and Ondangwa Airstrips can be arranged at reception.Breakfast, lunch and dinner are served in the dining room. The bar with traditional drums and murals of dancing tribesmen has a relaxing mix of cultures and conversation. The courtyard with its lush garden and swimming pool provides the ideal atmosphere for a relaxing sundowner after a busy day.Relax around the pool or depart on an interesting tour of the surrounding traditional villages. 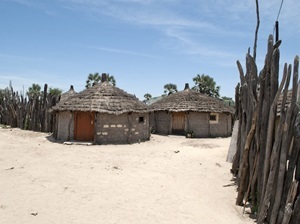 Oshakati is the hub of trans-border trade with Angola and is the ideal base from where to explore the Northern region. Experience traditional Ovambo “kraals” and the nomadic Himba lifestyle in the barren Kaokoland, or visit the Ruacana Falls, do white water rafting in the Kunene. Ruacana Eha Lodge in northern Namibia is a natural gateway to the wonders of the Kaokoveld, the Etosha National Park, the Epupa falls and the vibrant African culture of the Omusati, Oshana, Ohangwena and Oshikoto regions. This glittering oasis in the rugged landscapes, offers relaxation, conferencing and opportunity to come face-to-face with forgotten Africa. All 21 double rooms as well as the family suite offer en-suite bathrooms, air conditioner, tea & coffee facilities, TV, telephone, fridge and a private verandah.